Volcano Bárðarbunga is hard for me to pronounce. There are two rolled r's in a row. I have a hard enough time with regular r's, like in library. I was hoping I could call it something like Volcano MuaHAAHahahaaa because of the resemblance to a villain planning some terrorist act. This led me to do more extensive research, to see if it really could be the jolt of reality that politicians need to start planning ahead to cope with climate change. Because it's a blog and I know most people don't want to read the whole thing, I'll go ahead and admit it probably won't be that kind of volcano. Saturday, August 16 a seismic swarm started around the caldera of Bárðarbunga, which is underneath a glacier. Since early June GPS stations have indicated activity under this massive volcano. Taken together that means magma movement, but it is over 5 km below the surface. Over the course of the week the earthquakes have moved to the east and north along a fissure. My favorite site for up to date information is the Icelandic Met Office. I wonder what he means about the Icelanders having specific plans for their hydroelectric energy? I expect magma melting 400 meters of ice in a day would be a pretty epic flood. What do they do exactly? I found a PDF about the plans one hydroelectric plant has in place for a catastrophic flood from magma under a glacier. 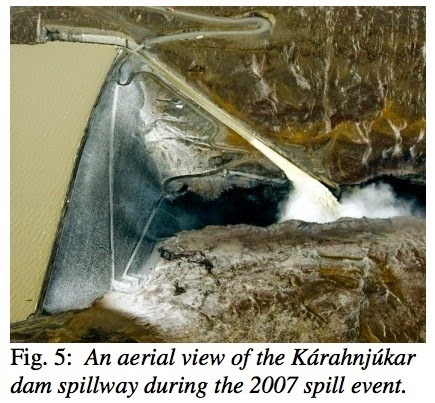 Flood design criteria for Kárahnjúkar dam – a glacially dominated watershed by G.G. Tomasson et al. This one is northeast of Bárðarbunga, to power an ALCOA aluminum smelting plant. I'm starting to think there is likely a dam that's going to get damaged if magma erupts under a glacier no matter where it happens. This particular reservoir is formed by three dams. The biggest one has these tunnels that send the water to a powerhouse some distance away. I guess that right there is the biggest precaution. The tunnels will only pass so much water. The power house should be protected even if the dams are completely destroyed. That's the map from the Civil Engineering Report. Now here's the map from the Icelandic Road and Coastal Administration showing the area evacuated because of the risk from this volcano. It looks like the ALCOA plant is outside the evacuation zone, but just barely. 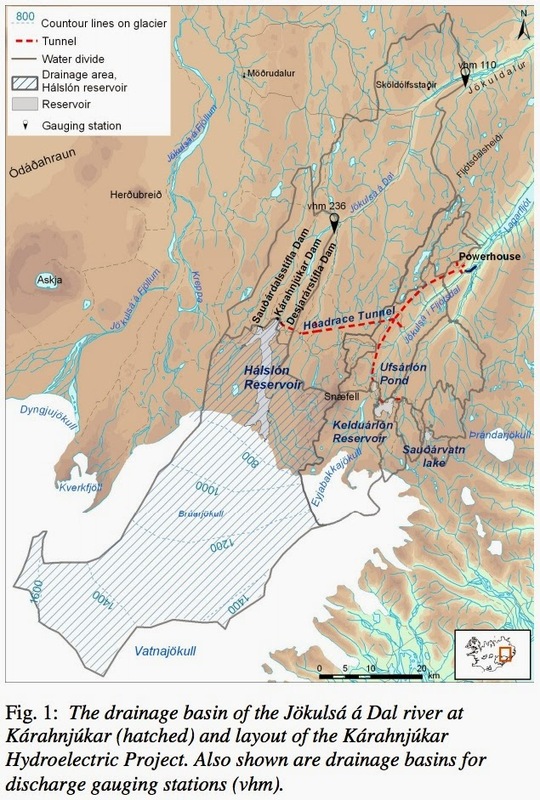 Several active volcanic areas are known to exist underneath the Vatnajökull glacier, none of those however within the drainage basin of the Hálslón reservoir. Still the possibility of volcanic activity within the reservoir drainage basin cannot be ruled out with absolute certainty. No specific legislation or regulations apply to flood design criteria for dams in Iceland. Landsvirkjun has therefore developed their own rules, based mostly on Norwegian regulations for flood design criteria for dams, but adapted to Icelandic conditions (VST et al. 2006). In particular, these have been adapted to the possibility of drainage basins covered partly by glaciers with areas of potential volcanic activity underneath. I guess if the basin for this reservoir was coincident with the fissure they're watching for this volcano they would have evacuated this area too. They may not get to try out their countermeasures this time. But if they did, what would they be? Here's a photo from the report showing how the spillway of the largest dam works for a run of the mill hot summer glacier melting flood. What is up with that turbidity?! Doesn't look like the glacial rivers and lakes I've seen. That's got to have ecological repercussions. The countermeasure for the magma under the glacier melt amount for one of the smaller dams is called a fuse plug. I never heard of that before, but it sounds interesting. Basically they blast out the rock and then refill the hole with something that is more likely to erode. When the big rush of water comes down the river from the glacier this whole end of the dam washes out and trashes the valley downstream, but hopefully the dam doesn't get destroyed. I imagine that if it overtops the dam the falling water undermines the front side and the whole thing just tips over. They don't really say. Here they explain where they came up with the numbers to use in their calculations. An even larger flood than that estimated above could result from major volcanic eruption underneath the glacier. As there are no known active volcanoes within the catchment area, no direct data exists to assist in estimating the potential size of such floods. Experience from a major eruption at Gjálp in Vatnajökull glacier in 1996 some 20-30 km west of the Hálslón drainage basin indicates continuous discharge of some 6000 cubic m/s from direct melting of glacial ice by the volcanic activity for several days at the height of the eruption (Gudmundsson, 1997). 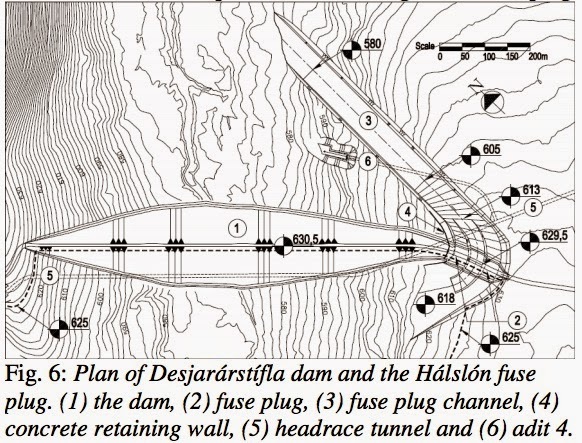 This estimate is used as a catastrophic flood for the Hálslón reservoir. Apparently that high turbidity behind the dam ends up deposited on the sides when the water level goes down in the winter. Then comes the wind and it turns into dust storms. It's always something when you try to mess with natural processes on a large scale. Anyway, now I know more about how to build a dam against the contingency of a magma intrusion melting a glacier. Now I can start referring to the road over the culvert in the creek as a fuse plug. * Update: Saturday August 23: "A small lava-eruption has been detected under the Dyngjujökull glacier" from Icelandic Met Office. You can see in the map above this is the glacier adjacent to the drainage basin for the reservoir I talked about.